Description: Intermodal Trains are boring eh? Description: A VERY DIRTY BNSF 4960 leads this Z-train. 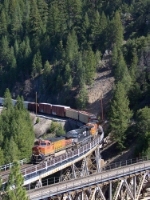 Description: Taken from K-177 overpass. Now do you believe Kansas is flat? Description: The units on this train are BNSF 4960, NS 7518, BNSF 4502 with distributed power on rear BNSF 5344 and 1095. Description: Ex-Conrail #6722 lead two BNSF C44-9 locomotives pulling stack train on LE line @1236h. Description: A stack train runs up the big hill at Vaughn. Title: 2 Units about to cross over UP.